Because of the private nature of the property, it was possible to create rooms with generous windows without fear of neighbors looking in, yet we still situated the house and the spaces within it to take advantage of south light. Houses with a smaller footprint naturally lend themselves to the creation of spaces where you are never far from a window. 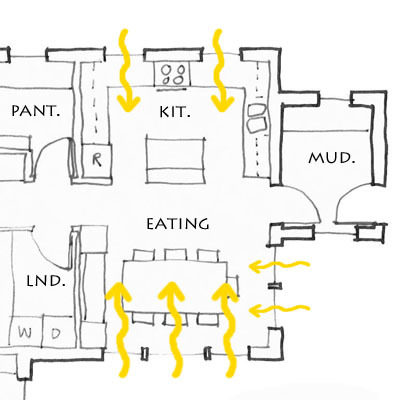 We purposely designed the house to be long and narrow, so both the "working" side of the house (kitchen/eating/every-day entry) and the "resting" side of the house (fireplace room/guest space) have windows on three sides. The working side of the house, shown above, is very open to the south and east where the eating area is located. The north side is punctuated by three large square openings that march along the front facade of the house. By clustering upper cabinets on the two side walls of the kitchen, we were able to have beautiful windows within the kitchen itself without feeling like it was short on storage space.